If you want to install a HTML email signature into your Gmail, you have come to the right place. GMail users are in luck as the installation process is very straight forward and simple. Assuming that you have a HTML email signature created already, follow the 4 easy steps below to get your great looking email signature installed. UPDATE 11-01-2018: Click link to read our updated guide to create and install a HTML email signature for Google Gmail. If you don’t have a HTML signature, you may read my tutorial, Create a HTML Signature in Apple Mail on Lion OS X 10.7 to get started on creating one yourself or you may use our html signature service to create one for you at a small cost. Drag your HTML email signature file into your browser. For this example, I use Safari but you may use any browser of your choice. 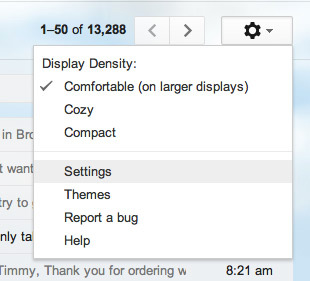 In Gmail, you may see a Machine Bearing icon on the upper right hand side. In the drop down menu, go to Settings. Under the General tab in Settings, scroll down till you find the Signature section. Click inside the Signature edit box and go to Edit > Paste to paste in the HTML you have stored in the clipboard (Command+V). Click “Save Changes” right below the Signature edit box. That is it! You are done! If you run into any problems installing your HTML email signature into your GMail account, let me know by writing in the comments section. I will try my best to help or maybe a fellow reader may. I hope this tutorial is helpful to you and it would be a great pleasure to see your creation so please showcase that wonderful signature you have created! Brad, what seems to be your problem when you followed my tutorial? I’ll see if I can help. I am trying to set my clients signature with Hyperlinks and images in gmail but not getting successful. Its a very important task if you please help me out ? Carlos, the images have to be hosted in order for the images to be visible after it is sent out to the recipient. The images are visible to you because the images are loaded on your local computer. I am not getting image. 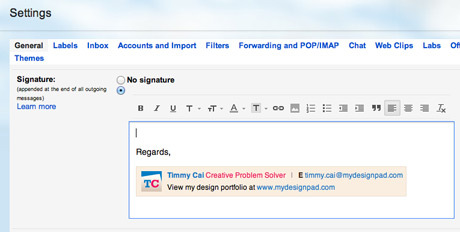 when i am pasting the email signature i am not able to see anything in gmail signature box. 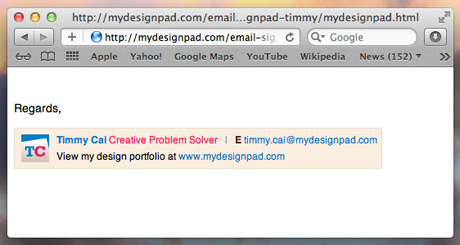 Preview/copy the HTML design with Google Chrome or Safari and then paste it into the Gmail signature box. That should sort the problem. In order for the images to load, the image have to be hosted on a web server. If you need help, check out my service page: http://mydesignpad.com/htmlsignature/. I can help you write up a proper HTML email signature file and host the images for you to ensure that the signature will work perfectly. Looking to insert an email signature into our gmail accounts that includes images and hyperlinks – can you assist? Hi Holly, I would love to help. We can communicate via email for details. I have already written an email to you. Please check and reply. Thanks. The stye has to be inline in order for most mail clients to read it also you have to use tables instead of divs. Cesar, you are correct. Email programs aren’t as sophisticated as web browsers. Thanks for sharing and helping out here. Everything comes over except there is a large gap next to our logo. Have tried both Copy and Select All and both produce a large gap. Caroline, the html codes have to written in a very specific way in order for the email programs to translate it well. Even then there may be a little bit of a spacing and font issue. Nothing major though. Is there any way to find out html code of gmail signature? I want to use my gmail signature for my outlook account but outlook doesn’t allow to add images in signature section. Is there any simple solution for it. I am not very technical. Thanks for your help. Everything work like charm if I follow your tutorial. But one point which I am facing why it’s not work if I copy paste from notepad? Hey Tim. I had you design my signature a year ago. Looks great and working well. I have been able to set it up through Apple mail without issue. I am not trying to set it up through Google Mail, through the regular gmail.com. I followed your steps and pasted it into the signature box. After I save and try to compose an email, the html just shows up rather than the signature. Any thoughts? Hi Brian, make sure you have selected HTML on your Google Mail Reading and Composing settings. Also using Google Chrome to preview and to do the select all and copy step during the installation. Good Luck! It works best when you preview the html design via Google Chrome. Perhaps, Notepad doesn’t render the html codes properly and makes it less compatible with Google Gmail. Do you have the html codes of your gmail signature? 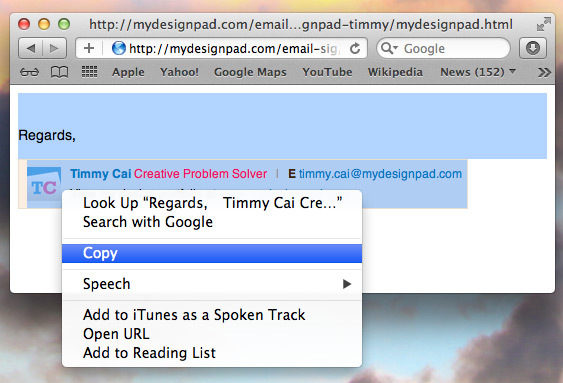 If not, try this: select and copy your email signature from your gmail signature section on your gmail settings. Paste the design into Google Chrome. 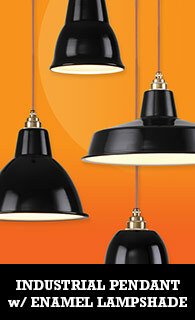 If you are able to see your email signature properly, you may do a select all and copy. Then go to your Outlook Preference> Signatures and paste it into the preview window after you create a new email signature. Hope this works. I’ve made a nicely formatted html5 file with my email signature included and uploaded it to my server. After copying & pasting it into Gmail’s signature section it shows up properly. However, after I send an email with this signature it falls apart both at the recipient’s side and in the sent email section. The html5 file contains embedded/inline css formatting with a few specific #id related styling. It seems Gmail “forgets” these specific margin settings. Can you suggest a workaround for this? When I drag my html file to my browser (tried Chrome, Firefox and Safari) I only see the html text, not the signature I made. How can I fix this? Most email programs aren’t as advance as current web browsers. To get the best results, stick with simple HTML using tables and cells and primitive inline styles. Goodness, so easy. It works. You’re a rockstar. It will never let me save. Google says it’s too large. Any suggestions? Dear Laura, are you using any images in your design? If yes, make sure they are optimized for the web. In an other word, make sure the image size is small. is there a way to avoid the underlined links ? in my html signature, the links are not underlined, but when i copy paste, gmail automatically change it… and it’s not possible to have th etelephone number and the adress underlined…. As of now, I don’t think there is a fail-proof way to get rid of the underlines. There are codes that can be put in place to get rid of it but when it gets rendered thru gmail and or various email apps, the blue underline comes back out. I tried this and it worked, thank you very much I appreciate you taking the time, however I’m still having an issue with an underline link. You are correct. Email programs aren’t as sophisticated as web browsers. Thanks for sharing and helping out here. 3) I created an html file where i use this image and attach different links on it based on coordinates. 4) when i cmd A, cmd C and then cmd V in gmail the image shows up but when i click on any of the specified areas nothing happen. As if the whole thing is a simple image. I think email apps aren’t as sophisticated as web browsers for security reasons but it shouldn’t be so. Check out our brand new HTML Email signature service website: https://www.htmlsignature.com. Today I updated the image for a signature on our server. It shows correctly on the browser but when I paste in Gmail (replacing the old signature) it still loads the old image. While composing the message I still see the old image. However, when I send a test email, the receiver sees the new image. Also, if the message is saved in the drafts, it will be with the new image. I’ve been following your tutorials for years, really admire your job. This website is a great reference for my IT team.